On the day I went to Peterborough station most East Coast up trains were now using the new platform 3. The new lights at this end of platform 1 were still not in use. Temporary lights which were on all the day, were being powered from a generator van. The old Platform 2 at Peterborough station has been renumbered as platform 1. The old Platform 1 was the up bay platform and its track has been removed, so as they could renumber the old platform 2 as platform 1. 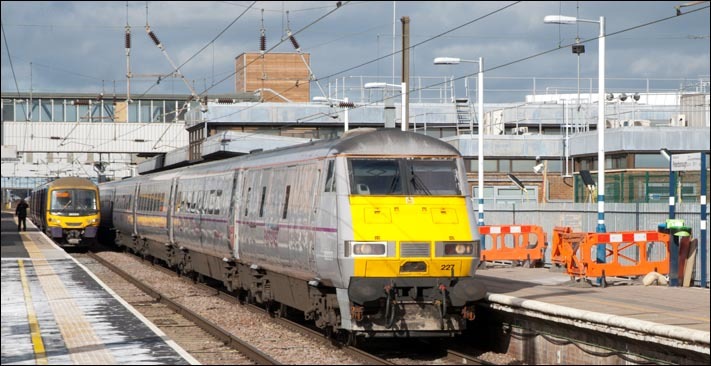 The new platform 1 will be used for the new 12 coach Thamslink servies to South London and Gatwick Airport which started in 2018 as well as the East Coast up trains to London Kings Cross and East Midlands Trains to Lincoln. East Midlands Trains class 153 384 in what is now platform 1b at the north end of the renumbered platform. First Capital Connect class 365533 in platform 1 at Peterborough station on the 21st February 2014. 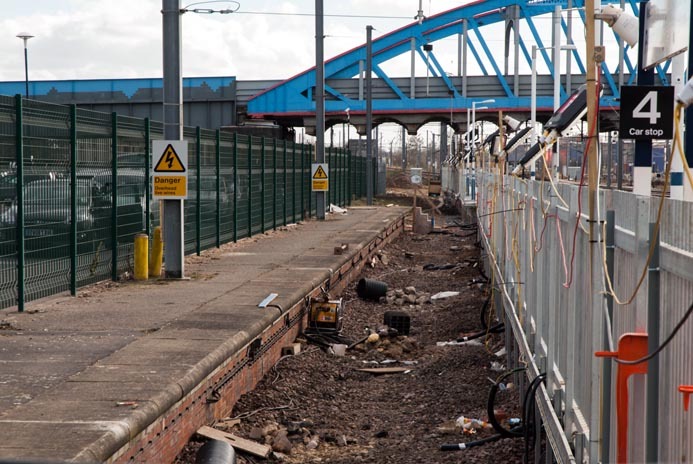 The old Bay platform at Peterborough station (which was platform 1) with the track removed in February 2014. Passengers only used the right hand side. The fence is new. The wires are to the temporary lights. This bay platform could only hold 4 car EMUs. The new longer platform 1 goes over were the track came into the bay. Nothing much has been done to the old bay apart from a tidy up, and it still in 2018 looks much the same. On the day I went to Peterborough station most East Coast up trains were using the new platform 3. The lights at this end of platform 1were still not in use and temporary lights which were on all the day powered from a generator van. East Coast class 91130 leaves the renumbered platform 1 at the rear of a train to London next to the main enterance on the 21st of Febuary 2014 . 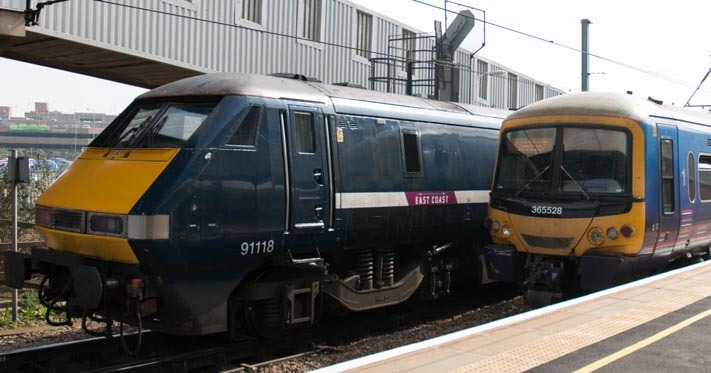 East Coast class 91110 Battle of Britain Memorial Flight leaves the renumbered platform 1 at the rear of a train to London on the 21st of Febuary 2014. Platform 1 has been made longer and now goes under Crecent Bridge, which is why the bay had to go. This Page is about the new (re-numbered) Platform 1 which is part of this upgrade at Peterborough railway station. The new platform 1 will be then used for the new 12 coach Thamslink servies to South London and Gatwick Airport which started in Febuary 2018 using platform 1 and 2 and 3. 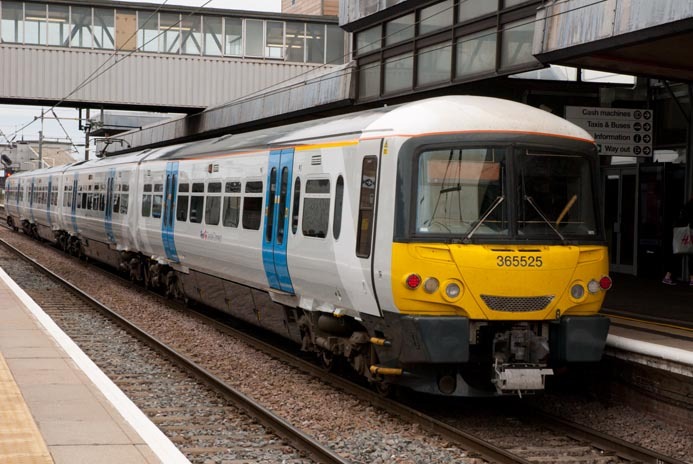 These new services using Thameslink's new class 700 trains were to go pear shape when the new time table started in June 2018. With Many trains not running or very late. The TV and press were to be full of it in 2018. Too few Drivers, or those that were at work, not yet trained on these new services were some of the reasons. 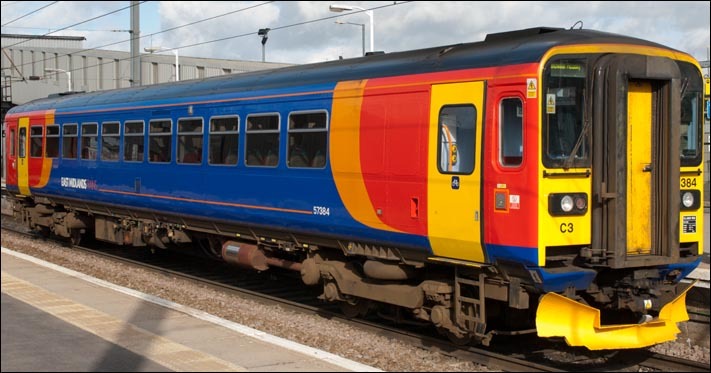 The class 365s were in 2014 starting to be repainted in white with blue doors and this was one of the first ones so painted. 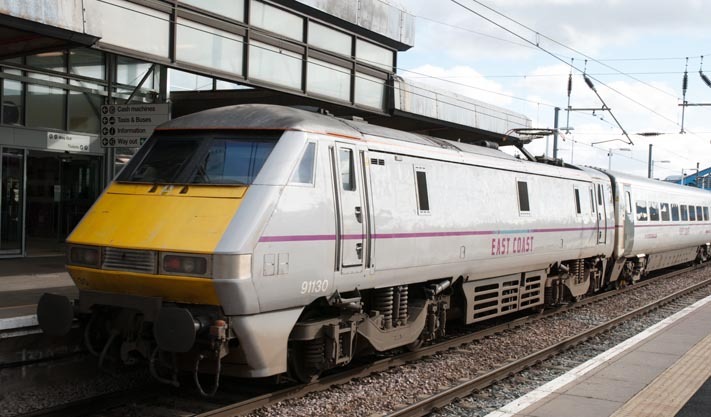 East Coast class 91118 yet to be repainted in sliver grey is in the renumbered platform 1 at the rear of a train to London on the 29th of March 2014. First Capital Connect 365528 is in the re-numbered platform 2 at Peterborough.